/ Society / What AILS Indian Democracy ? What AILS Indian Democracy ? Hindustan belongs to all those who were born and bred here and who have no other country to look to. Therefore, it belongs to Parsis, the Israelis, to Indian Christians, Muslims and other non-Hindus as much as to Hindus. Free India will be NO Hindu Raj : it will be Indian Raj based not on majority of any religious sect or community , but on the representatives of the whole people without distinction of religion. The non-Hindu people in Hindustan must either adopt the Hindu culture and language , must learn to respect and revere Hindu religion, must entertain no idea but the glorification of the Hindu nation i.e. they must not only give up their attitude of intolerance and ingratitude towards this land and its age old traditions, but must also cultivate the positive attitude of love and devotion instead; in one word , they must cease to be foreigners or may stay in the country wholly subordinated to the Hindu nation claiming nothing, deserving no privileges, far less any preferential treatment, not even citizen’s rights ( We or Our Nationhood Defined,1938). The RSS was against the movement for India’s independence and considered freedom fighters (who aimed at a democratic India belonging to all those who are born and bred in India ) to be traitors. The Constituent Assembly produced a constitution, which is an embodiment of the ideals of the independence movement . Hindus, dont waste your energy fighting the British. Save it to fight the internal enemies that are Muslims, Christians and Communists. 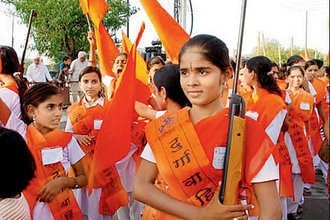 The disturbing development in the country is the result of the RSS-BJP’s determined effort to replace the India belonging to all Indians by an India in which Muslims and Christians must accept the status of second class citizens since they are considered ‘internal enemies’ as described by Golwarkar (who is the most revered Sar Sangh Sanchalak of the RSS ) and resistance to the effort . India is in for more turmoil due the clash between a democratic India and the votaries of a fascist Hindu Rashtra. But where Hitler and Mussolini failed, the men of straw who are trying to imitate their fascist tactics cant succeed .